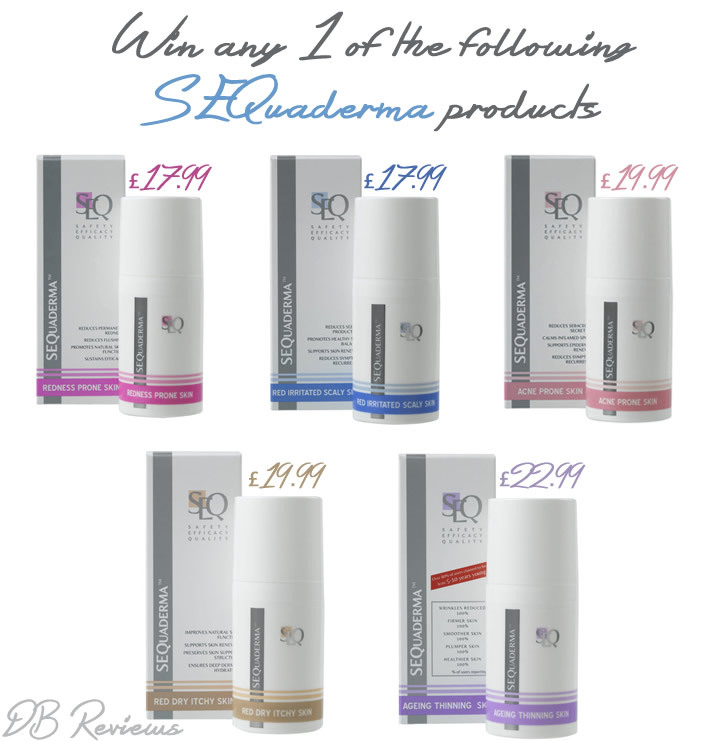 SEQuaderma are a new skincare range that launched recently. It is a scientific brand and their products use a gel formula that contains nano-technology, where tiny vesicles carry the product right in through the skin’s layers to address the source of the skin problems. The range at present includes five products; each of them targeted for specific skin conditions like Rosacea, Eczema, Acne, Dermatitis and Ageing & Thinning skin. My OH has been using the SEQuaderma Acne product with good results. You can read the review here. SEQuaderma has offered one of my blog readers the chance to win any one of their products. The retail price for the range is between £17.99 and £22.99. You can see all the 5 products listed above. Enter the giveaway and the lucky winner can pick any one of these skincare products. All the best. I would like to try the redness prone skin cream to help my rosy cheeks! The SEQuaderma Acne for my teenage son. I'm looking for a product that works & is good for his young skin too! The Ageing and thinning skin as I need all the help I can get! I'd try the redness prone skin one. The red itchy dry skin product. I would choose the Aging and Thinning Skin product. Love to try first the Ageing and Thinning Skin being in my forties I always enjoy products to minimise the ageing process. Keeping my skin moisturise day and night helps. would like to try the acne prone skin one, even at my old age, I cant stop those horrible spots. I would try the ageing-thinning-skin as these are my main skin concerns. I'd love to try the ageing and thinning skin one, please! I would choose the acne prone skin because I have acne and eczema. Would be great if it works. I would like to try the ageing and thinning skin as I like to take extra care of my skin. I would like to win the ageing and thinning skin product please. I would love to try the Rosacea one. Dermatitis as this is what I suffer from. I'd like to try the Ageing & Thinning skin - my lines and wrinkles would definitely appreciate it and I would love to look a little younger! I have acne prone skin and red skin. These look like the kind of product I would love to try!